A lovely piece of work… and it’s for sale if you want it. 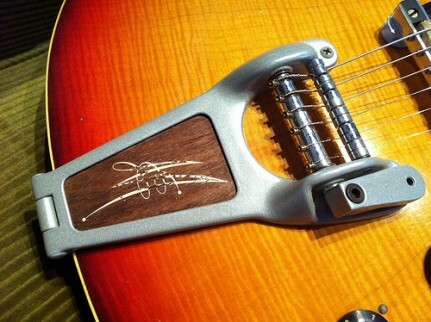 Holy crap, they were Maton knobs. I ran across and pulled her down from the hook. 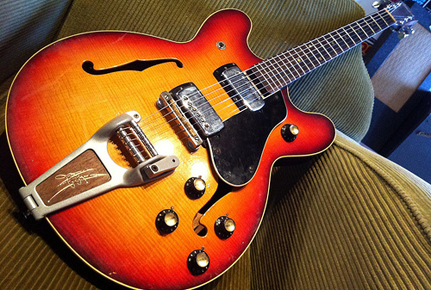 She was a beautiful, unmolested cherry sunburst Maton Sapphire, with flame figuring front and back.. It was solid and very weighty. The wood inlay looks great, though the Maton ‘M’ has seen better days. Also the arm was missing, but someone could make something to suit easy enough. The finish was grey metallic paint, so it’d be easy to match. 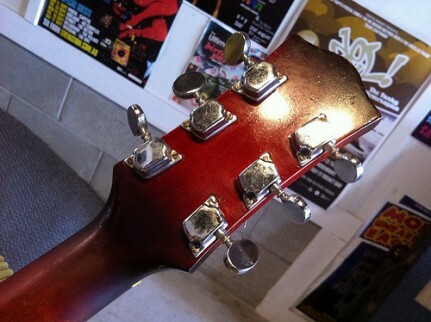 The headstock was a slimmer shape than the usual Maton shape. The neck shape was a bit clubbier than my Apollo. 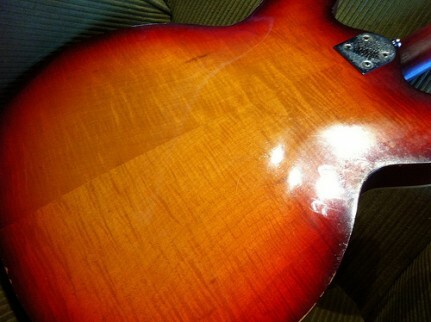 It’s not huge or anything, it’s just I prefer the slimmer Apollo neck which feels more classic Maton to me. Luckily this was all the incentive I needed to decide not to buy it. Although this guitar looked and sounded gorgeous, the neck didn’t blow me away. This is my guitar buying requisite. I have to LOVE the neck, otherwise I won’t play it. Lucky… otherwise I would’ve had to add it to my guitar pile. dang that’s purdy,i’ll have to resist going down to the shop to find out how much is on it as i’m on record as saying no more guitars for me now i’ve finished building my latest,which coincidently is semi acoustic with similiar paint job to the sapphire and coronado,red/yellow sunburst.still got room for at least another maton bass though. 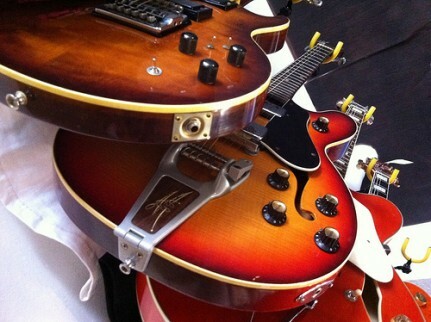 Yes, this Sapphire has been sold and is now in the loving company of several other Maton brothers and sisters. 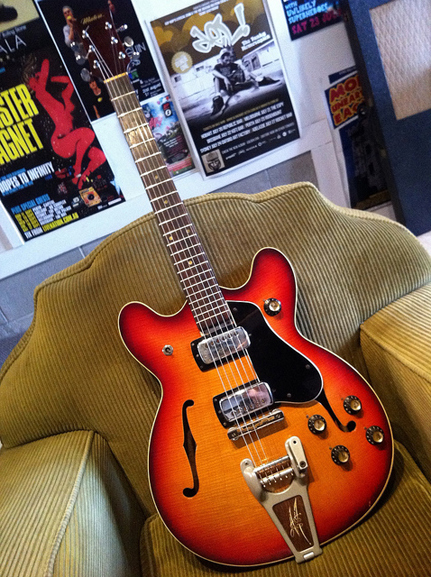 Indeed it has a beautiful mellow and jazzy, semi-hollow sound, esp. at the neck pickup, with the treble turned lower. I could not stop playing jazzy style music when it just arrived, even though I am not a jazz guitarist. Every single note simply sounded great!! 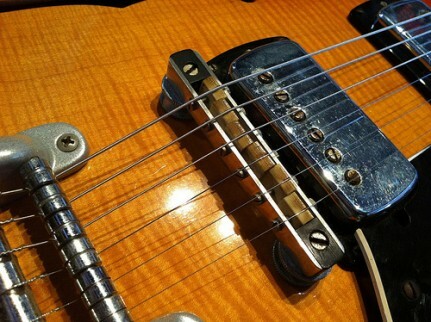 But it is not just great for jazz, it also has a nice bright sparkle and bite with the neck pickup, and a lot in between. Tony mentioned that he did not like the ‘clubbier’ neck. I did not know that word, I guess he ment that the neck is a bit thicker than the average vintage Maton. Correct, but I do not mind at all and I am thankful that Tony did not buy this one! Indeed you hardly see them. In the last couple of years I have only seen one with original pickups that was almost similar to this one, so I guess that it must be rather rare. I do not miss the arm for the tremolo, but if anyone has suggestions where to get one that would match, please let me know. Anyway, thanks again, Tony and Tym’s! I’m selling my Sapphire De Luxe ’71. Will be emailing photos to post here shortly. I wonder what type of strings would be better for this baby, any suggestions ? 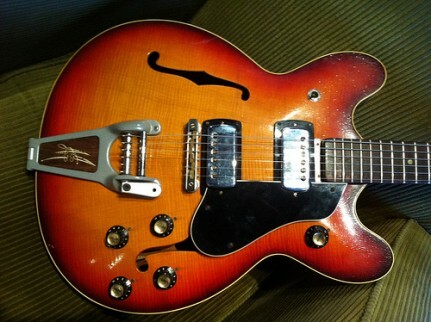 I have a Cherry 1966 Sapphire I’m thinking about selling. Any ideas on value? I was wondering where to post this message – I figured here, but how do I insert pics? reckons it cost alot. any1 interested? 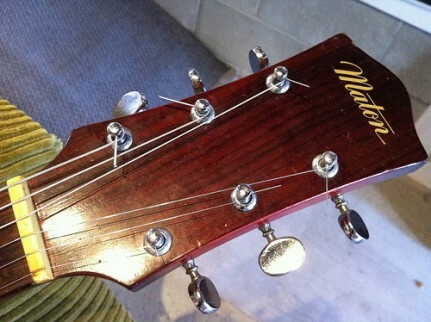 Does anyone know the age and value of a Maton Sapphire Deluxe, the numbers on the identification sticker is 7121 4741. The guitar belongs to an old friend of mine, he has played it for many years so it’s not perfect. Thanks in anticipation . Hi Rick, what sort of price range for a Sapphire? Hi there. I have a Sapphire that is going to be sold. NIce original condition. One piece back with some lacquer checking. The weird label says Custom Acoustic Six String. Serial is 662. That appears to be a factory error as it is definitely original. It all works and complete with trem bar etc., original knobs. Original frets though have likely been dressed. I have an old Premier I plan to restore too. Anyone out there with a Maton Sapphire for sale? I have a Maton Sapphire De Luxe Bass Guitar,Model 402/4, Serial No.336. (969). and a Maton Ibis Bass Guitar, I have been trying to find out what they would be worth for Insurance cover(But are not for sale). If anyone has an Idea, they could get in touch through my email, barry.johnston2@bigpond.com.